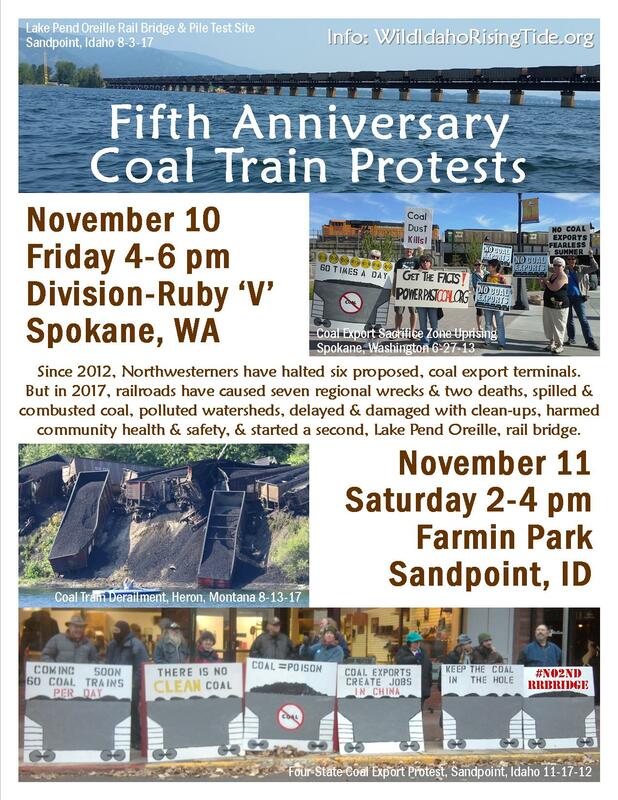 Please join climate activist collective Wild Idaho Rising Tide (WIRT) and regional allies for Fifth Anniversary Coal Train Protests on Friday, November 10, from 4 to 6 pm, at the North Division & Ruby Streets ‘V’ in Spokane, Washington, and on Saturday, November 11, from 2 to 4 pm, meeting at Farmin Park to protest elsewhere in Sandpoint, Idaho. Dress warmly and bring your friends, family, neighbors, voices, drums, musical instruments, and signs and banners addressing coal, fossil fuel, and railroad industry impacts on people, places, and the planet. WIRT will provide pizza, beverages, and safe, direct action opportunities at these public demonstrations commemorating the first, November 2012, coal train and terminal protest in Sandpoint, organized by Moscow, Sandpoint, and Spokane activists [1, 2]. Since 2010, the shared resistance of Northwesterners to dozens of proposals for new and expanded fossil fuel infrastructure and transportation projects has halted six planned, coal export train terminals in Boardman, Clatskanie, and Coos Bay, Oregon, and Cherry Point, Hoquiam, and Longview, Washington. In the last few months, the Washington departments of Ecology and Natural Resources have denied essential permits to the proposed, Millennium Bulk Terminals coal transfer facility in Longview [3, 4]. In response, Millennium has filed multiple lawsuits against Washington agencies, and continues to seek county and state land use permits, while a coalition of citizens and conservation groups participates in local, public hearings and celebrations of the company’s likely defeat in this epic, regional struggle against dirty, dangerous coal, to protect healthy air, water, climate, and communities. But in eastern Washington, north Idaho, and western Montana during 2017, Burlington Northern Santa Fe Railway (BNSF), Montana Rail Link (MRL), and Union Pacific Railroad have caused eight catastrophic derailments and collisions with resulting deaths, injuries, and destruction, spilled and polluted the Clark Fork-Pend Oreille River watershed with grain, coal, and track washout-released, smelter slurry, dumped additional coal and imposed fire hazards from combusted coal on adjacent communities, through damaging and delayed, wreck clean-ups, spewed ongoing coal dust and diesel emissions from six-plus, empty and fully loaded, daily, coal trains, consequently and cumulatively risking and harming community and environmental health and safety [5-11]. On the summer 2017, Idaho Panhandle, fossil fuels frontline and sacrifice zone, BNSF and Union Pacific constructed double tracks along much of their routes between the Canadian and Montana borders with Idaho and Spokane, Washington . BNSF ran noisy, smoky, pile load tests with a huge crane and heavy equipment, near the popular, recreation area of Dog Beach Park south of Sandpoint, Idaho, in preparation for the keystone project of its regional, railroad corridor expansion: a proposed, second, parallel, 4800-foot-long, rail bridge that could carry more coal, oil, and hazardous materials trains (the Northwest pipelines-on-wheels) over Lake Pend Oreille to Salish Sea refineries and a Vancouver, B.C., coal export terminal . 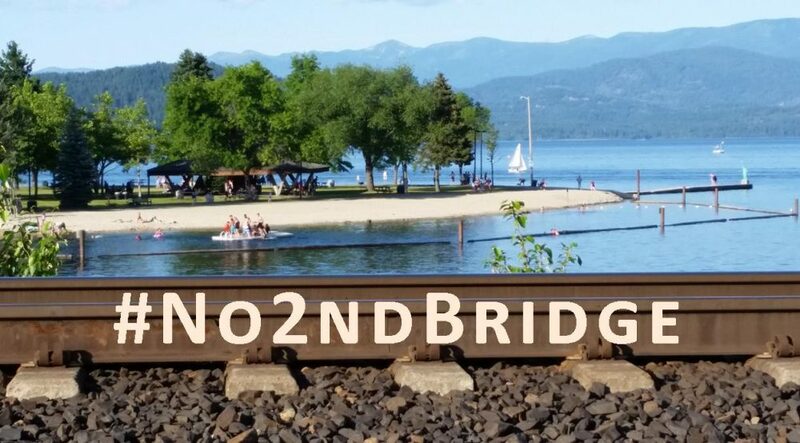 The relentless observations and documentations of WIRT activists, contributing to the #IDoiltrainwatch and #WAoiltrainwatch over several years, by monitoring westbound, unit, coal and oil trains traversing downtown Sandpoint, suggest that BNSF may be planning to build (over our blockading bodies) a second lake span to alleviate the westward bottleneck of increased, Bakken shale oil and Powder River Basin coal train traffic, like the MRL coal trains frequently seen and heard idling for hours, near the trackside, regional, lake water intake and purification plant at the Sandpoint-Ponderay, Idaho, boundary, awaiting eastside access to the current (but soon also doubled), single-track, BNSF rail line through downtown Sandpoint and over the lake bridge [14, 15]. Now that public pressure and government agencies have essentially banished all coal export terminal proposals from the Columbia River and Northwest coast, west-side Cascadian participants in the oppressive regulatory system, which usually dismisses but sometimes nominally grants citizen demands, are celebrating “victory.” But such success is never complete while coal and railroad companies continue to pollute air, water, and lands, ignite fires, and endanger communities across the Northwest with the train traffic, emissions, and infrastructure that thousands of citizens spoke against during countless public hearings and comment periods . We must further insist on issue resolution, through ongoing, proactive protests, initiatives, and all possible work to reduce and stop Northwest coal trains and their impacts, like Proposition 2, the Safer Spokane, November 7, ballot measure/city ordinance requiring fossil fuel companies to cover coal train cars and stabilize the flammability of Bakken crude oil prior to rail shipment, by removing most of the volatile, natural gas components (propane, butane, etc.) . Fifth Anniversary Coal Train Protests also stand in solidarity with the six Spokane Climate Protectors, the Raging Grannies and Veterans for Peace who twice blockaded coal and oil trains in East Spokane, during August and September 2016, and whose January 2018 jury trial will include a historic, climate necessity defense in Spokane District Court [18, 19].